The world of industrial communications appears as a multilayered, multidimensional, occasionally confusing mixture of fieldbuses, software packages, and media. James Powell did MORE with LESS in his book. If you are new to this field or simply don’t know where to start, and then this book is for you. He shows in this book that when industrial communications is understood and then installed with forethought and care, network operations are both beneficial and painless. This book is designed to speak to the beginner, to take that interested newbie by the hand and guide them through the bus route to communication success. Book topic include all BUS operations, protocol details, physical layers and networks, network design basics, installation tips and suggestions, commissioning, maintenance, plant asset management and troubleshooting. On reading this book, we really enjoyed taking the PROFIBUS road trip. This is definitely the best book out there for people who want a firm basic understanding of what is required when implementing a PROFIBUS system and improving safety, efficiency and productivity of your organization. James Powell: PROFIBUS is an open protocol which means that it is not controlled by any one company, rather by a group of 1300 member companies called PROFIBUS International. AM: Is it vendor specific? James Powell: No, with over 1300 member companies, PROFIBUS is anything but vendor specific. AM: While planning a new network what qualities must we have in a control system and does PROFIBUS offer these? James Powell: I have worked with a large number of different networks in the past. I have always wanted something that is reliable, easy to use, fast, versatile and easy to wire, robust, easily integrated into higher systems, and with a wide variety of field devices. I had never seen protocol that met these requirements until I started to use PROFIBUS. That is why it is my favourite. AM: When a System Integrator often says that this type of network takes too long and costs too much, is it lack of training or understanding? James Powell: A PROFIBUS installation will cost you less money in the long run and will take far less time to commission. Lack of training and understanding is a very common problem. AM: For training PROFIBUS technology, where do you recommend to go? James Powell: The PROFI Interface Center in Johnson City (http://www.sea.siemens.com/us/pic/Pages/profi-Interface-Center.aspx) is the best location for certified training. However, a number of others also have some great training course. In particular, I am lead instructor on two different PROFIBUS course offered here in Peterborough, Ontario by Siemens Milltronics. AM: Is there a deficit in Fieldbus’s ability to communicate to the enterprise level layer? James Powell: No, in fact I would say that one of the strengths of Fieldbus technology is its ability to communicate all the way up to the enterprise level. AM: What is a recipe for a successful commissioning? If you go in with this mindset, then regardless of your startup process, you will be successful. Problems occur when people treat a PROFUBUS device like a 4-20mA device. I addressed this in detail in the commissioning section of book. AM: Some system architects seems to understand its value but some don’t see PROFIBUS value in this tough competition. What’s your take on this? James Powell: PROFIBUS offers many advantages over conventional wiring, but it does require a change in mindset. You cannot continue to do things the way you did with 4-20 mA when working with PROFIBUS and expect to see the benefits. Your procedures have to change. This can be scary to some. It is far easier to stick with what you know. However, those who do change will be at a cost advantage to those who do not! AM: What’s the best approach in troubleshooting and what is required for successful troubleshooting to minimize downtime. James Powell: PROFIBUS is very robust. Therefore it is possible to have a network that looks ‘OK’ from the controls systems point of view, but is not. The best approach to minimize downtime is to be proactive with troubleshooting. Use the tools that we have now and verify that the network is solid before a problem occurs. That way you can fix things before trouble hits and avoid downtime. AM: We are talking about Fieldbus here, not Ethernet. That’s been tough thing to decide. How should decision makers gain confidence on this approach for the benefit of the end user? James Powell: Ethernet is just another physical layer. Right now, RS-485 and MBP are two physical layers that PROFIBUS uses. 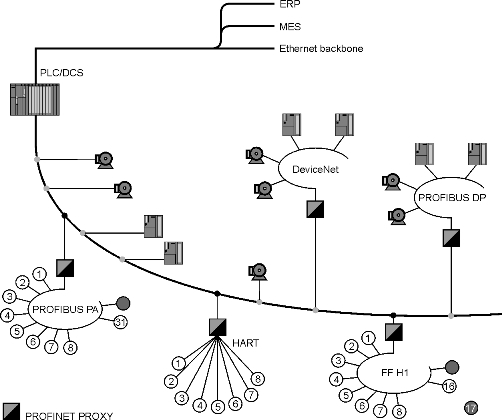 Ethernet is a physical layer that Profinet uses. Since Profinet and PROFIBUS are in the same family, you can easily connect them together. Then it is simply a mater of choosing the best protocol for the application. AM: What do you see in the future direction of industrial communications when more and more instruments manufactures are offering Ethernet communication? James Powell: Currently PROFIBUS physical layers offer some noise immunity advantages over Ethernet in many applications. I see this changing over time as the technology advances. In the PROFIBUS world, the path is clear and easy. There will be slow migration to PROFINET. I think that it will take some time for this to get all the way down to the instrument level. AM: What was big idea behind writing this book and who is intended audience? James Powell: For years I have been promoting PROFIBUS and teaching it. The one thing I noticed was that although there were many good books on PROFIBUS, there was not a really good introductory level book aimed at the process industries. This was my aim. To help me out on this task, I was joined by Dr. Henry Vandelinde who has a Ph.D. in Medieval literature. If you want an introductory level book, the pairing of an expert with someone who really knows how to write and ask questions is an excellent one. AM: How you see future of Industrial communication and what is biggest challenge you see in next decade for industrial communications? James Powell: I see industrial communications as having two big challenges. The first is education. Everyone know about 4-20mA; few understand fieldbus. The second is the recognition that this technology fundamentally changes operational processes. You cannot implement a fieldbus project and keep all the business progresses that you had in place for 4-20mA and expect to be successful. AM: We found this book a very easy but in-depth read, filled with lots of practical examples and anecdotes. Could you please tell our readers that where to get this book? James Powell: The easiest place to buy it is from www.measuremax.ca. Many of our local Siemens Process Instruments offices also have it for sale. We are currently looking into ways to improve distribution.